Under contract with the European Domestic Agency, the NKMNOELL-REEL* consortium is manufacturing a pair of cranes for the ITER Assembly Building. These cranes, each with a lifting capacity of 750 metric tons, will work in tandem to transfer component loads of up to 1,500 metric tons along a continuous crane bay between the Tokamak installation area and the Assembly Building. Each crane will be supported by two giant girders that span the width of the Assembly Building. 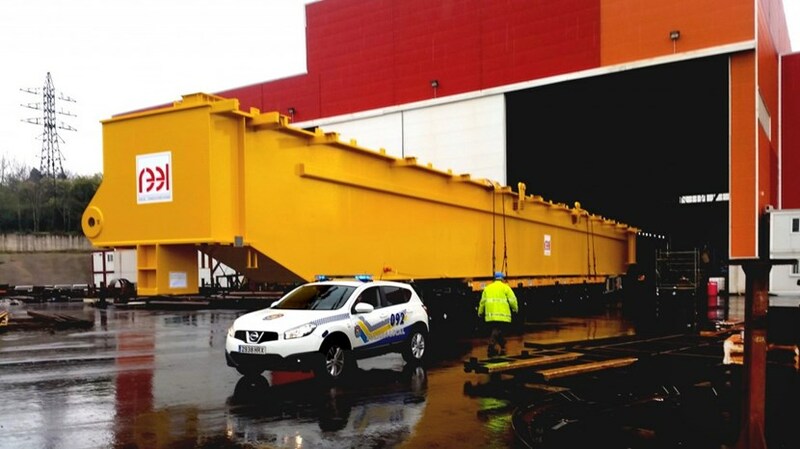 The first two of these 200-tonne components have left the factory in Spain and are waiting to be loaded at Aviles harbour in the province of Asturias. Two others will follow shortly. Assembly is also underway on the four trolleys (two per crane) that will host 375-tonne hoists. Once all trolley activities are completed, and they have passed factory tests, they will be delivered to the ITER site in May. The scope of the contract concluded in 2013 between the European Domestic Agency and NKMNOELL-REEL includes the design, certification, manufacturing, testing, installation and commissioning of the two heavy-lift cranes, as well as two auxiliary cranes with a lift capacity of 50 tonnes each that will be used for lighter assembly activities and the Tokamak Cargo Lift that will move casks containing components in the Tokamak Building. The assembly cranes will be installed through the roof of the Assembly Building with the aid of a giant crawler crane. * The NKMNOELL-REEL consortium is formed by NKMNoell Special Cranes GmbH, Germany and REEL S.A.S., France (part of Groupe REEL). See the full story on the European Domestic Agency website.